Do you love snowflakes and want to capture them to look back on time and time again? You can do this by taking pictures of snowflakes. 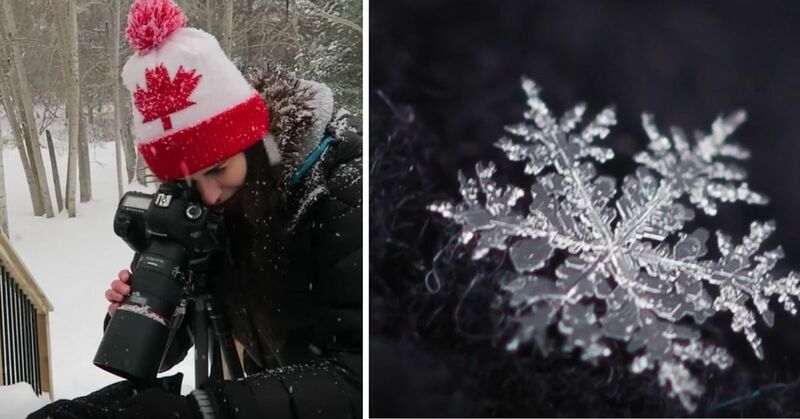 Here are 6 tips to help you capture real snowflakes. Each snowflake that falls from the sky is uniquely designed. Using the right settings, tools, and tricks, you can take a great image of snowflakes. Here are some tips on how to take photographs of snowflakes. You need the right tools to take photographs of such tiny subjects. A macro lens around 100mm is ideal, although you can get away with using 50mm with a crop sensor camera. Adding lighting with a macro ring light will also help. Having a tripod handy to reduce camera shake and a lens cleaner to get rid of unwanted snow should be considered too. Your settings need to be adjusted to take great pictures of tiny snowflakes. Keep in mind the exposure triangle: ISO, aperture and shutter speed. Since you are taking a close up of a very small object, keep the shutter speed high (1/200), the aperture small (f/10), and a high ISO (2500+). These are just numbers to start with so test out the settings until you find one that works with the snowflakes. Invest in a microlens or use the poor man's micro method. To do this, get your 50mm lens and put in on your camera backward. The aperture will have to be manually adjusted. This can be tricky but is an alternative to buying another lens. Have fun looking for snowflakes and take plenty of pictures of them. Remember, each is individually designed with its own uniqueness. Try to shoot flakes when they are falling or lying flat and not at an angle to keep the focus sharp. Keeping these tiny snowflakes in focus might be challenging at first since you are shooting small objects up close. Getting the camera in focus manually might be better than automatically since the camera might have a hard time focusing on such small subjects. Shooting snowflakes in dark backgrounds are ideal since this will bring out the details of the snowflakes. If you can't do this in the natural surroundings you are in, bring objects and fabric in dark colors to achieve this. Remember, experiment and have fun capturing real snowflakes.